Often, cars are more likely the culprit when there’s an accident because they are larger in size and more powerful. But if you’re going to consider the data arising from various bicycle-car accidents, bicyclists are as likely to cause road accidents as the motorists. As more cities adopt bicycle-friendly cultures, bicycle-and-car accidents become more common. Even though cyclists often enjoy their own lanes, cars and bicycles still share the road. In most states, they also share the same traffic laws—and liability for negligence. By remembering these common causes of bicycle-car accidents, you can help protect yourself from injury and lawsuits. The “Right Hook.” Many bicycle lanes are along the side of the road. When there isn’t any bike lane, cyclists often ride close to the shoulder. Drivers turning right at an intersection might not see cyclists approaching on their right and accidentally cut them off. The “Left Cross.” This happens when a car, turning left at an intersection, pulls into the path of an oncoming cyclist. The bicycle could be coming from the opposite direction or going in the same direction as the car on its left side. Not all roads have stop signs at intersections. Sometimes, a car will heed its stop sign but not realize that an oncoming cyclist, with the right-of-way, doesn’t have a stop sign. 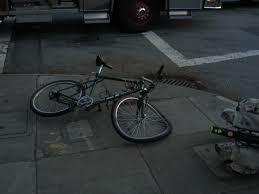 The car then pulls out in front of the bicycle, causing a collision. Other times, the bicyclist has a stop sign and the car does not. Some states require that cyclists come to a complete stop at intersections. If they don’t, and are involved in a collision, it could bar them from recovering damages—regardless of who was at fault. Sometimes cyclists follow too closely to cars. If a car stops abruptly, it can lead to a rear-end collision. Drivers who fail to check their mirrors can accidentally block a cyclist’s path by opening their doors as the cyclist approaches. Both cyclists and drivers can take steps to minimize the likelihood of an accident. For example, cyclists can always ride with traffic, wear reflective clothing and use hand signals to indicate their intentions. Drivers can exercise greater awareness of cyclists and maintain a safe distance. When it comes to road security, still both bicyclists and drivers should take the proper precautionary measures. They should both learn from the common bike-car collisions to make them reminded about possible accidents and how to avoid them. This entry was posted in Car Accident. Bookmark the permalink. Who is Responsible for Hazardous Road Conditions? Who Is At Fault When There Is A Bicycle-Car Accident?